Singapore’s food producers may soon be locally growing a lot more fresh produce due to an innovative new vertical farm system created by Singaporean company, Sky Greens. Until now, food producers on the city-state island hub of South East Asia, have struggled for room to produce fresh fruit and vegetables in the densely populated city, opting for imports. In fact, only 7 per cent of Singapore’s fresh food is grown locally, but the new vertical farming techniques expected to bring this number to ten per cent. The Sky Greens vertical farm is a 3.2 acre urban farm that uses minimal land and resources, offering a sustainable approach to growing produce in heavily populated cities. The A-Go-Grow vertical farm systems are protected by outdoor green houses, with the advantage of producing tropical leafy vegetables year-round. 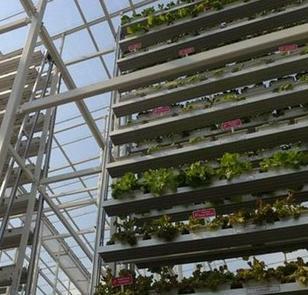 Currently the vertical farming systems can grow Chinese cabbage, spinach, lettuce and bayam. As the farm expands, Sky Greens have said that they plan to grow a diverse range of vegetables. Sky Greens have said that they would like to turn their 120 A-Go-Grow vertical farms into 300, with the support of investors. If Sky Greens are successful in creating 300 vertical farms, daily vegetable supply is expected to go from 0.5 tonnes to 2 tonnes over the next year. As well as the economic benefits of continuous production and higher yields, Sky Greens say that the vertical farming system also offers many environmental benefits. The A-Go-Gro systems use low carbon, hydraulic green technology and thus have reported very low energy costs. Similarly, Sky Greens say the vertical farming systems also offer low water costs as the vertical crops are irrigated through an “innovative flood method” that utilises recycled water. Vertical production systems have been used in China for a number of years, as reported by Australian farmers who have seen several systems on visits to China during the past decade.